As 2012 draws to a close, I’m convinced that we’re now witnessing the start of a period of unparalleled development in the startup scene within Edinburgh. 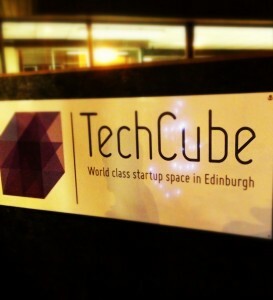 And no single event highlights this development more accurately than the events of last Thursday night when pretty much the entire startup community from near and far descended on Summerhall for the launch of TechCube. The event had generated a fair amount of press interest, with publicity building from well before the visit of Alex Salmond last month and culminating in recent articles in the Wall Street Journal, The Next Web and Creative Boom, amongst others. Having been in the building a number of times over the past few months, I’ve also previously written about TechCube on this blog (such as here) and it’s been heartening to see move ahead in leaps and bounds between each visit. As MD Jamie Coleman stepped on stage to declare “We’ve finally got there!”, there was a palpable sense of optimism and, undoubtedly, relief within a room packed with the great and the good of the local entrepreneurial tech community. The origins of the facility lie in the hard physical labour – literally – of local startup community members who donated weekends over a number of weeks to work together voluntarily in ripping down walls and ceilings in order to create something of lasting value to all. So – mission achieved. And, with that ethos in mind, the formalities of the evening were thankfully kept to a minimum but it’s worth mentioning a couple of points from the talks if you weren’t there. Nigel Eccles from FanDuel, one of the launch sponsors and a significant new tenant of TechCube, with the company having chosen to use the building as its global HQ by basing its 28 UK staff there, started by giving the audience a potted history of the journey that he, and his co-founders had taken to arrive in TechCube. His comments on the local startup ecosystem itself were the most telling, as he ran through how he and his five co-founders had spent a significant time around five years ago discussing the type of company that they wanted to work for and the culture that it would have within it. Looking around Edinburgh, it was clear that it didn’t already exist so they decided to create it. Too early for these discussions when your business has a grand total of zero employees? For many perhaps. Yet, the reality was that the founding team went through the complex process of reaching agreement on critical business issues before significant decisions actually arose, leaving them with a clear (albeit just as challenging) path forwards. Nigel stressed the importance of creating a hugely successful business. Why? Success begets success. Instead of simply bemoaning the lack of available startup capital locally, success is crucial in helping other local companies attract investment and, even more importantly, talent. I particularly liked his definition of success as being framed by whether ex-employees subsequently go on to create successful businesses of their own – effectively a validation of business success by the recycling of talent amongst the local startup community. That’s the approach that is required, in my view, to build an effective and efficient entrepreneurial ecosystem. And, in keeping with this, it was great to hear that Nigel intends to set aside a regular time slot each month to meet with local entrepreneurs to share his experiences. This is exactly why this event marked such a significant point in the development of the local tech startup system. The level of support and potential for cross-fertilisation between highly talented and motivated groups of people has just been increased exponentially by having a physical location for such serendipitous exchanges to take place and this should never be underestimated. Indeed, as Plan For Cloud – a TechCube business that was unusually acquired within only a few months of existence – was told by its US acquirer RightScale, Edinburgh currently has the feel of Berkeley some 20 years or so ago. “Why not Edinburgh?” indeed. Finally, Robert McDowell, owner of the entire Summerhall Arts venue (of which TechCube is a part), took to the stage to explain a little more about the vision. Stressing the need to strive continuously for innovative and creative solutions when solving problems, the Summerhall venue as a whole is dedicated to Arts, Research and Education – with Entertainment coming in a distant fourth place in the list of priorities. Everyone is encouraged to think broad and deep in working towards building something really quite special. With Polly Purvis of the ICT trade body,ScotlandIS reminding everyone that the estimated 100,000 people who work in ‘tech’ in Scotland generate around £4 billion-worth of value to the Scottish economy annually, no-one should ever underestimate the power of collective action within a sector. And so, onto the rest of the evening. After another tour of the building, the event neatly segued into the annual Edinburgh Startups 3rd Annual Christmas party, this year hosted in the old Dissection Rooms, with live bands, a trapeze artist, free beer and a seriously tasty selection of food, washed down by smoothies from the ever-reliable Hula Juice Bar. In my experience, few events over the past few years have ever come close to bringing the numbers of people out to mingle from within the startup scene from such diverse backgrounds. There was a real surge of optimism at the event amongst everyone that I spoke to and a shared belief that something special is now getting going. The level of goodwill is significant and there can be no doubt that everyone is desperate for the venture to succeed. By its nature, it will be an inclusive facility, attracting increasing levels of money, talent and support with each success – and who within the local community of entrepreneurs, investors, mentors, advisors, trade bodies and government organisations does not want to support that? Massive thanks go to all involved in the organisation of the evening. I know for speaking to so many that there was a huge amount of hard graft put in to get to this stage – and it’s still only at the beginning. But the foundations are here. How the story develops, for Edinburgh, Scotland and beyond is now down to all of us. Were you at the launch party? Or do you agree that TechCube will provide a much-needed level of support and enthusiasm for the local startup scene? I’d love to hear your comments below or let me know via Twitter. Note: This blog post originally appeared on the MBM Commercial LLP Startup Blog. Previous Previous post: Access to Social Media at Work: Who’s Leading? Next Next post: Scottish Startups: A Great 2012 – But A Better 2013?